If one is lucky, all family photos are labeled. 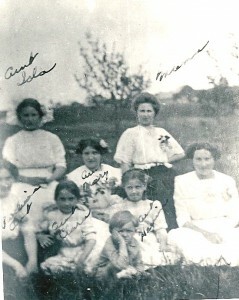 However, even this Hein family photo taken in Spring 1912 on the family farm in Rib Lake, Wisconsin has two people unlabeled. Who were they? How were they connected to the family? Using family lore, church and county records, cemetery headstones, census records, plat maps, local newspapers and other local library resources, the mystery was solved. The answer brought these women’s spirits alive and helped the present generation understand their loved ones.